Every flower is special in its own way. Angels often speak in the language of flowers, at least that's how messages often show up in my life. 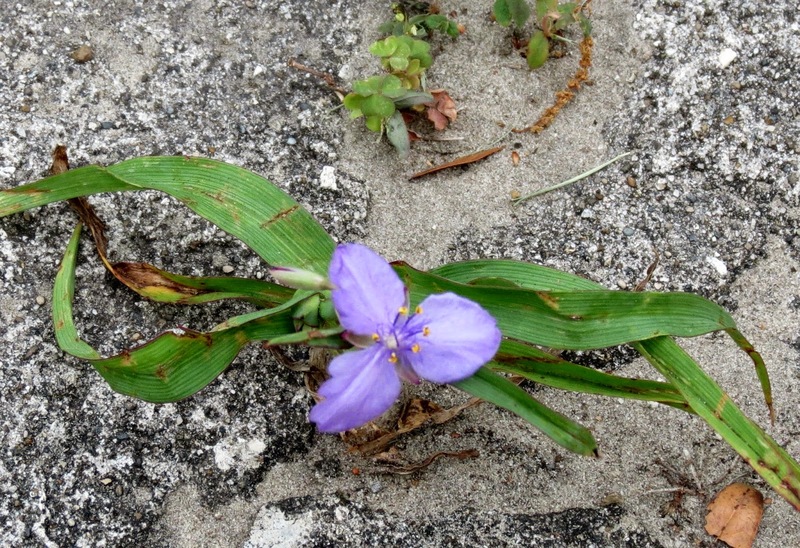 Even a crack in the sidewalk can be helpful in fulfilling a purpose; as demonstrated by one of my favorite free-spirited flowers, the purple Spiderwort. When I looked out the front door this morning, what a surprise. There it was blooming on the sidewalk. I hadn't noticed it before. The lawn service had come on Saturday, but the angels had protected this little volunteer plant. The Angel of the Spiderwort seemed to be saying: Against all odds, I did it! I found a way when it appeared there wasn't one. Now, look at me! I deserve to be regarded. (How could I miss it, in the middle of the front walk?) Another sign, that God is the mystery, the substance of all Life. So, isn't it comforting to know that even in chaos, there is perfection. The need to keep everything perfectly under control can restrict spontaneity and creativity. A break in the pattern can be purposeful, creating space to blossom.